Welcome to our Active School page. All classes receive at least one hour of PE every week. The strands of the PE curriculum are Athletics, Aquatics, Dance, Gymnastics, Games & Outdoor and Adventure. All children go swimming for an eight week block every year. All children do basketball and GAA as well as playground games. Tag rugby was also introduced this year with a focus on the games strand. Land PAWS Water Safety Programme was introduced. The children receive two outdoor breaks per day - little break & lunch-time. Children are encouraged to "Do your talking as you're walking" in Term 2 & throughout the school year. Our yard was zoned into playground, basketball court, soccer pitch and grass area - upper & lower yard. 6th Class have become playground leaders this year. Playground leaders assist in organising equipment, labelling equipment, putting out the equipment at the start of lunch & collecting the equipment at the end of lunch. Playground leaders are also assisting in leading a running initiative in our school. Children also participate in rainy day breaks before or after break or lunch on wet days in school. Our school gets involved in a number of active events every year. This involves dressing up & walking to our local hall at Halloween for a Witch Walk & concert. Seachtain na Gaeilge involves walking to our hall for a céilí mór & concert celebrating St. Patricks Day. Our school reinforces the message that children require 60 minutes of physical activity every day. During Term 1, children completed the pocket planner. Our school promotes physical activity when classes are lined up in the yard. Children get active in their line with active lines linking to active jars e.g. 20 jumping jacks, 40 punches in the air. Our school held an Active Slogan Competition. Well Done to all children! Our Active Slogan is "Make a start and get an active heart". Our school has an Active Committee which is made up of 12 boys and girls from all classes. There are four children from the junior end and eight children from the senior end. The Active Committee meet regularly usually on a Thursday. The main role of the Active Committee is to communicate with their class and teacher e.g. Active Slogan Competition, Active Jars, Active Suggestion Box etc. The Active Committee assist with the survey "What Club are you in?" Many children are involved in various clubs in our locality such as Slaney Valley Community Games & Kildavin GAA to name but a few. Our school works very closely with Slaney Valley Community Games. Our school links with the local GAA Club & County GAA for training. Last year we held a GAA Day with a local school to promote partnerships & physical activity. Our school works closely with Local Sports Partnership e.g. tag rugby and to make links for taster sessions during active week e.g. mindfulness / yoga. We are currently working with HSE / Health Promoting Schools in achieving a Health Promoting School Flag for our school which links to active school flag. We are renewing our Green Flag this year. Children participated in active travel or Walk on Wednesday a number of years ago. 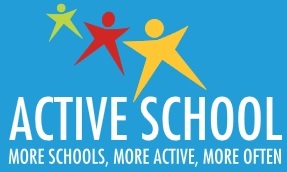 Our school has organised Active Week every June for a number of years. This is part of the annual school calendar. Children and staff wear tracksuits for the week. Every morning begins with "Morning Movement". Physical activity is encouraged as homework. Active week is held in June in conjunction with Sports Day & numerous other whole school fun events such as the active chants and team races. We held our Sports Day in the local GAA club grounds a couple of times. Taster sessions are also incorporated into Active Week with yoga and mindfulness introduced to all children during active week last year. Our school uses local amenities such as a walk to a local well "Walk a mile with a smile" undertaken by 5th & 6th Class annually. Our school has visited Altamont gardens for a walk in Spring. We used local facilities to organise a AA Day with another local school in June last year. Teachers play 6th Class in a game of basketball during active week annually. Parents are invited into the school during Sports Day. The entire school community is encouraged to get active during active week.